Marinate cleaned squids with chilli powder, turmeric powder and salt. Heat oil in a pan and add chopped onions, green chillies, garlic, ginger and tomato and saute well. Add marinated squids ,water (1/2-1 cup) , curry leaves and salt. Cover and cook till done and remove from flame when water completely dries up..Keep it aside..
Crush grated coconut and fennel seeds together without adding water and keep it aside. Boil 2 cup water adding salt. Add rice flour/ pathiri podi and mix well. Add crushed coconut mixture, mix well and make a smooth dough. 7. Divide the dough into small balls and flatten each ball in banana leaf/ parchment paper. 8. Add prepared squid masala on one side and gently fold over the other side and seal the edges (like adas..).. Loved your step by step presentation, never made squid in this way, delicious! Looks very yummy and inviting. 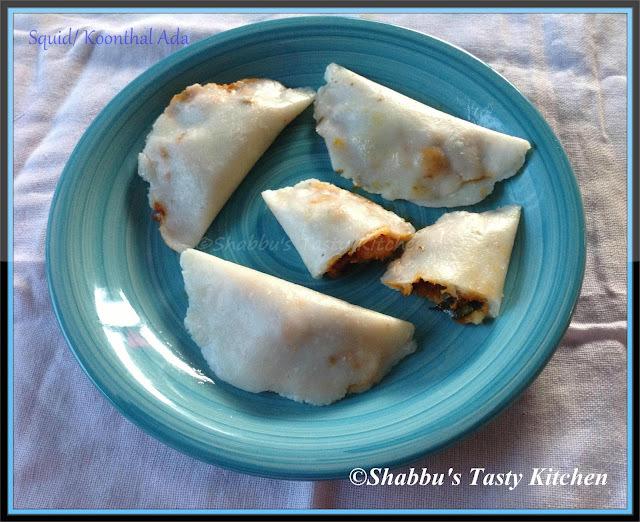 very new recipe to me...looks yumm..
Mashallah, lovely blog u've got here... :-) with lots and lots of yummy recipes.. Different and loving this savory ada.